As I was procrastinating and avoiding working on my dissertation proposal, I came across the 1935 Columbia University Press book . 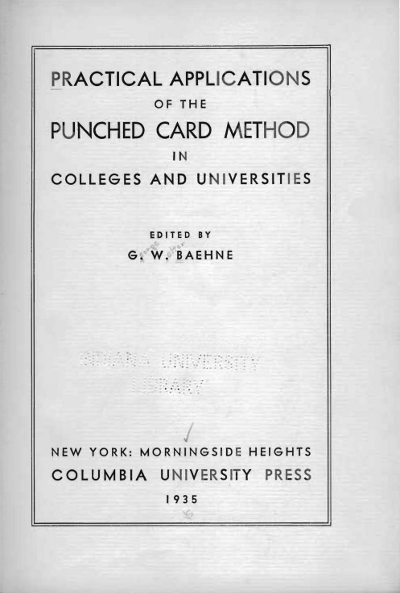 One (short) chapter describes how punched cards were used to analyze data from a survey of Phi Delta Kappa members in the early 1930s. I know that PDK is not the kind of social fraternity most people think of when they hear “fraternity” and this is no SurveyMonkey survey but this is still a wonderful example of a very early technology used by professionals in or very close to student affairs. For those too young to have used them or too old to remember them, punched cards were used for many decades by colleges and universities in both research and administration. Punched cards were used particularly frequently by registrars so it’s no surprise that student affairs departments used them, too. In fact, they were so widely used on campuses that they became cultural symbols of technology and standardization. For example, student protesters at University of California-Berkeley in the 1960s “used punch cards as a metaphor, both as a symbol of the ‘system’ – first the registration system and then bureaucratic systems more generally -and as a symbol of alienation” (Lubar, 1992, p. 46).